The Russian equivalent of the story of the Gingerbread Man is Kolobok (Колобок). Literally, a kolobók is a small, round loaf of bread, but it’s indelibly associated with the story in which a fresh-baked kolobok runs away, evades a rabbit, wolf, and bear, but falls prey to a clever fox (you can see an illustrated version here). Mandelstam uses it as a symbol for the poetic word in his remarkable 1922 poem “Как растет хлебов опара.” I don’t understand the poem well enough to try discussing the whole thing (a literal translation is below the cut), but I wanted to point to the complex imagery of the third stanza, which centers on two bread-related words, припек [pripyok], which I translated “surplus” as a shortcut but which means ‘the excess weight of a baked loaf over the weight of the flour used to make it,’ and kolobok, the loaf that ran away. I’m not sure why time is a regal herdsboy or who the stale stepson of the ages is, but the image of the word as a baked cathedral with a magical surplus that has to be chased down is pretty amazing. tries to catch the word-kolobok. for loaves pulled out before. Hat, it might be time to get yourself a comment spam filter. Hmm, I’m not sure it’s that difficult to understand. “Опара” is a yeasty batter that is used like a sourdough starter–the other ingredients are added into it afterwards to make dough. So the beginning of the creative process at first overwhelms the domestic soul with its heat. Then the rounds of dough grow into their perfection as they rise–a perfection that calls to mind the cherubim’s table (because rising bread is so round and even that this is what one thinks about). But it is necessary to put in lots of effort to carry the project to its conclusion, to create something more that oneself. So time, who is the servant of the baker (perhaps the baker is also a shepherd? This is a part I’m unsure about), catches the wily word-колобок and puts it to use. The Internet tells me that originally the колобок was baked in hungry times using all available scraps and remnants of different kinds of flour and leavening–this sense seems apropos here. And then the rejected, passed-over, coarse elements of past creative endeavors, which didn’t quite fit and were sold as makeweight, become part of this bricolage as well. If there’s another interpretation, I’d like to see it. I’ve mentioned “The Wheaten Loaf” before, and I think that thie is the book I mean. It was an illustrated children’s story in English from Bulgaria, and when the wheaten loaf escapes from the home, he rolls to the wheatfield and warns the sprouts sleeping underground (winter wheat I guess) that they will all be made into wheaten loaves. It sounded pretty grim and subversive, and was my favorite children’s book among those I read to my son. Presumably it’s a version of the same story. slawkenbergius: Well, sure, it’s about the creative endeavor, and in general my interpretation accords with yours, but I don’t feel I understand a poem until I can make at least provisional sense of all its details (as somebody said, nothing in a M. poem is there “просто так,” “just because”), and like I said, I don’t really get the regal herdsboy and the stale stepson of the ages. In your interpretation of the latter, “the rejected, passed-over, coarse elements of past creative endeavors” get stuck into the next loaf, but you can’t use stale chunks of bread to make a new loaf. Though you can make French toast from them. “French toast” in French is called pain perdu, “lost” or “wasted” bread. I had heard of “the gingerbread man” but had never read the folk story. It looks like it is an adaptation of the kolobok tale (a running piece of pastry is not believable unless it is anthropomorphic). But that tale itself, concerning a round object, reminds me of a well-known motif in some Amerindian mythology: the “rolling head”, which cannot be caught and wreaks havoc as it goes. The rolling kolobok could be a watered-down version of this motif (since the kolobok is not doing any actual harm). It might seem far-fetched to relate bits of Amerindian and European folklore, but there are many other similarities between native cultures on the two sides of the North Pacific (a topic I have long been interested in), and there is also much Siberian influence in Russian culture. The Wheaten Loaf was described as rolling from place to place. It sounded fun to be able to do that. Where’s Victor Sonkin when you need him? With Mandelshtam any image I don’t understand is probably from antiquity. The “regal herdsman” is царственный подпасок — more like the King’s Herdsman. The only thing I can think of is the herdsman who found Romulus and Remus, who went on to found Rome. From there we go to Hagia Sophia in the Second Rome, and then we come to the Third Rome? Dunno. Why didn’t my brain retain all that Greek drama and poetry I read in college? Пасынок is also an outcast, but I can’t remember any Greek outcasts. Or maybe that’s the poet? The grammar is not clear — the stale outcast/stepchild of the ages — [is] the drying makeweight/of loaves already pulled out [of the oven]. No, царственный подпасок is “regal herdsboy,” as Hat has it–царственный denotes a kinglike bearing, for instance, but there is not necessarily any actual king. And подпасок is specifically “herdsboy” or “herdsman’s assistant.” The word is unusual enough that the difference seems somehow important. The Norwegian version is about a pancake. Alarmed by the begging of the children it jumps out of the pan to flee from the wife, the old man and seven hungry children. Then it escapes a man and a number of animals, one by one, until it meets its destiny in the shape of a helpful pig. The fairytale is repetitive, first with all the children topping eachother in begging their mother for the treat, and then with the pancake rhyme-naming the increasing number of followers at every new encounter. I imagine it being told while cooking, as a ritual to keep the hungry children entertained. Yes, I was stretching a bit — I’m looking for the reference. I also realize I’m imposing what I know about Mandelshtam in general — the notion of continuity with transformation from antiquity to Russia (although St Petersburg was usually his Third Rome). Why is time like a shepherd boy with regal bearing? It seems to me that this is an allusion and an image. I’m not sure — but the image is creating these wonderous new bread domed churches — and I want to say in Rome, the Second Rome and the Third Rome — out of caught (and chosen) bread words. I’m not sure this helps to solve the puzzle, but Paris, the son of Priam, was raised by Priam’s herdsman and was tending cattle when called on to judge the beauty contest among Hera, Aphrodite and Athena. Maybe M. is describing how an idea that comes to a poet in the course of writing one poem but that ultimately is rejected for inclusion in that poem escapes extinction and lives on to form the kernel of another poem later. Might it be a religious instead of a classical reference, especially with the church imagery in the second stanza? Google translate says царственный подпасок can be “regal shepherd”. What could be more royal than a branch from the root of Jesse (the lineage of Jesus from King David’s father) and what other ageless shephard was raised by a stepfather (Joseph). Would this be odd for Mandelstam? Maybe this could be translated “time — the sovereign herdsboy.” (Nothing to do with Paris.) The passage of time works the transformation of the idea that turned out to be extraneous to the previously completed poem into the genesis of a new poem–the passage of time is described as a boy to reflect the playfulness of the creative process. The image is a boy tending a flock who keeps all the animals together and keeps them from straying. He catches the stray animal — the idea or the word that would otherwise run away like the kolobok — and the stale idea is corralled into a new poem and finds its appropriate place there. “Usykhayushchii dovesok prezhde vynutyky khlebov” — not “the dried out makeweight for loaves previously taken out of the oven,” but “the dried-out makeweight of (or from) loaves previously taken out of the oven.” In the previously completed poem the kolobok-word (or idea) was just a stale makeweight and had to be removed, but it becomes integral to the new poem. To add to my previous suggestions, this is after all a playful poem, with the wonderfully absurd juxtaposition of the loaf of bread baking in the oven, Hagia Sophia and the childish story of the kolobok. Google translates the title (and first line) as “How to grow bread opara”. If the Опара is sourdough starter for baking the word/Gingerbread boy that takes off and runs on its own, the starter has to be fed with something. Now we have dry yeast to dissolve in warm water and sugar to feed it, but it can also be fed with flour, although it would take longer for the yeast to grow. The leftovers from baking like the flour used to knead dough and keep it from sticking to the surface or from rolling out lefse I usually throw away, but if you were using a liquid starter I suppose you could put them back into the liquid for the next batch of bread. Time- The last time I did homemade middle eastern labnah I was stingy with the starter yoghurt and as a consequence had to wait an extra day for the yogurt to get solid before draining off the whey. Whether you are waiting for bread to rise or waiting for yogurt culture to permeate a bowl of milk, there is no substitute for time. For me the same is true of writing. If I leave something to marinate in the word processor overnight, it’s much easier to edit the next day. I am amazed at how many posts I have started that are still drafts, but if I look at the half-baked ideas, sometimes it takes very little to finish them. Boy did I go off in the wrong direction. After all, it’s Sophias – the Hagia Sophia in Constantinople, Kiev, Novgorod — architecture that was transformed in different times and ages, but also Divine Wisdom. So at the Cherubic table, the mystery of creation/inspiration/partaking of the divine wisdom occurs. I think, Bill (if I may) that you are right, and time is like a shepherd boy/servant that chases after wandering words and is also tsarstvenny – that is, regal, sovereign, anointed and divine (it’s creating churches of divine wisdom, after all). And in this creative process, the piece of dough once added to loaves of bread that have already been baked – the dough that was a stepson and outcast – Christ — not legitimate, not fitting in and now old and stale (it’s 1922) – finds its own place. A friend of mine who is studying M says that in his later poetry, things are not just one thing or another. That piece of dough could be an idea or a phrase that didn’t fit in at one time in one poem, but now time is chasing after errant words and it finds its place. It’s also Christ and the Divine Wisdom that the faithful partake in the mystery of the Eucharist. mab, I think you’ve got it. All the imagery not only makes sense in context but is echt Mandelstam. (A little odd that a nice Jewish boy was so obsessed with Christian religious ritual, but growing up when and where he did and being attracted to literary circles awash in Christian mysticism and symbolism, it was natural. I wonder if his conversion to Lutheranism in 1911 was purely formal, to evade the Jewish quotas, or whether it had deeper meaning for him?) And your friend is certainly right about things not being just one thing or another. I think this makes sense now. You’re right, of course, that M’s images were not symbols — that was kind of the point of Acmeism — but still, you need to pick up the allusions before you can make sense of his poetry. IF (big IF and so far not likely) the church could actually run school classes in Orthodoxy that were not proselytizing I’d be for it, since if you don’t know Orthodox Christianity you can’t understand a lot of Russian lit. I thought M converted just to avoid the quotas, but I think Nadezhda made a point of calling herself a converted Jew of the 8th generation or something. And Akhmatova was quite religious in her younger years. Begging the pardon of any admirers of Werfel and St. Bernadette here present. Picking up on mab’s reading of this poem in light of religion, could the poem be related to a Jew’s conversion to Christianity, with a touch of the convert’s anti-semitism–a rejection of the Jewish tradition as the dessicated makeweight of the loaves taken out of the oven previously, a long time ago, and an embrace of the newly baked bread of the Christian cathedral. Could the shepherd’s assistant who tries to lure out the surplus of the Jewish tradition by force or enticement be the good shepherd, the son of god, Christianity? Is the stepson of the ages finding his place in the newly baked loaves the Jew who converts and finds his place in Christianity? I recognize that I’m treading on sensitive ground for many (including myself) and this reading makes me uncomfortable. I believe that Mandelstam later embraced the Jewish tradition or at least the Jewish people, but could this reading be plausible at this stage of his life? Yes, it certainly could. He did indeed embrace Judaism later on, but at this stage it made him uncomfortable (see “The Judaic Chaos” in his quasi-autobiography The Noise of Time). 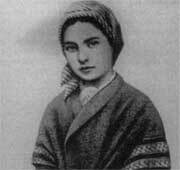 Werfel’s work is The Song of Bernadette. I double-checked the title on the Wiki page for Bernadette. Incidentally, in her earliest photograph she is wearing a shawl with a distinct crease, rather than a fold, on the shoulder. Bernadette spoke the Gascon dialect of Occitan and there is a small amount of her dialect quoted (in one case, with a parallel “official” spelling which did not exist in her time). The text says that she referred to the Lady who appeared to her as just Aquero which means “that”, true if it was an adjective but here it is a pronoun meaning “that one”, in the feminine form (the Montpellier equivalent would be written aquela). I mix up the song, the movie, and the book. Werfel was one of the exiles who did well in the US. 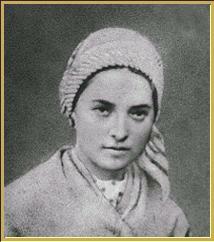 Bernadette Soubirous of Lourdes |here| and |here|. You might also say that Christianity (and other religions?) were “pulled out” of Judaism in the same way that Buddhism was pulled out of Hinduism, that is, they depended on the traditions of the earlier religion for their meaning. That’s interesting. It fits with the notion of transformation of the ideas/words/notions/images/myths etc of the past. Thanks, Hat, for posting the poem. There’s no reason why there can’t be multiple ways to read the poem. I suspect the real definition of art is that it is able to inspire some emotional connection with the viewer. Looks like Mandelstam is doing that even in translation. I found this thread through a vanity search; is there any way to receive updates to a specific thread? Here’s my attempt at translation (I didn’t read yours before trying). Catches the word, the kolobok. of breads taken out [of the stove] before. If pressed, I’d retell it as follows: Christianity entices and enthralls, but becomes increasingly esoteric for an outsider; the only way to penetrate it is through words, which are inherited from an even older tradition; thus, a stepson of that tradition can now find his place in the fold of the new faith. Far-fetched, I know; but Mandelshtam was actively involved in examining his faith at the moment. As for the “царственный подпасок”, there’s a telling (later) quote, when he says “Моя кровь, отягощенная наследством овцеводов, патриархов и царей” – apparently these things, and his Jewishness, were connected in his mind. Thanks, those are great additions, and I don’t think your interpretation is far-fetched at all. I’m afraid I don’t know of any way of getting updates to a thread other than bookmarking it and checking every once in a while, but unfortunately because of spammers I generally have to close them after a couple of weeks (though I’m always glad to reopen them if someone writes and tells me they have a comment to add). And to think it took us two days collectively just to figure out it was about religion. It’s great to have a native speaker confirm that we were on the right track. The second comment in the thread is by a native speaker. I thought it was his mother. The peppernut that rolled to the gates of heaven. (Spoiler: Saint Peter eats it). The lyrics are by Halfdan Rasmussen, so from around 1950, but there’s no reason why he can’t have loaned the idea from the folk tale. Fascinating! I wonder what the original source of the story is? When it was running away, it went by a barn full of thrashers, and they asked it where it was running. So they piked away after it with their flails, and it run and it run till it came to a ditch full of ditchers, and they asked it where it was running. Well they all ran after it along with the rest till it came to a well full of washers, and they asked the same question, and it returned the same answer, and after it they went. At last it came to a ford where it met with a fox, who asked where it was running. The Wonderful Cake, from Patrick Kennedy, The Fireside Stories of Ireland (Dublin: M’Glashan and Gill, 1870), pp. 19-20. The Stinky Cheese Man and Other Fairly Stupid Tales. The title character is always on the run because he thinks people want to eat him, but really they just want to get away from his odor. All the stories are kind of mixed: the plot summary at the link is correct, but utterly fails to capture the craziness of the story. The Stinky Cheese Man and Other Fairly Stupid Tales was my brother’s favorite book when he was about five.